A good starting point for further research is the 3-D-documentation of single finds and their context. 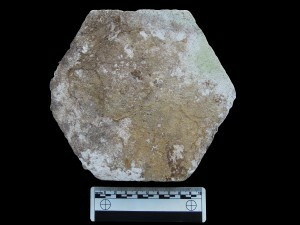 This included finds from our marble-piles, which were 3-D-photographed (see pictures below). 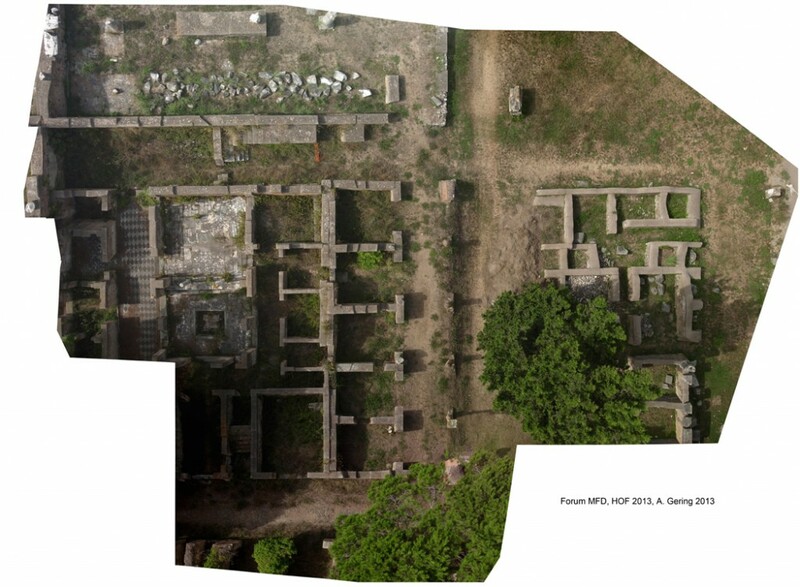 It also included all former finds of the old excavations conducted by Guido Calza and others (see pictures further below: the Viktoria / Nike from the temple roof, found in 1923 and the actual camera-system for the 3-D-recording in 2014). 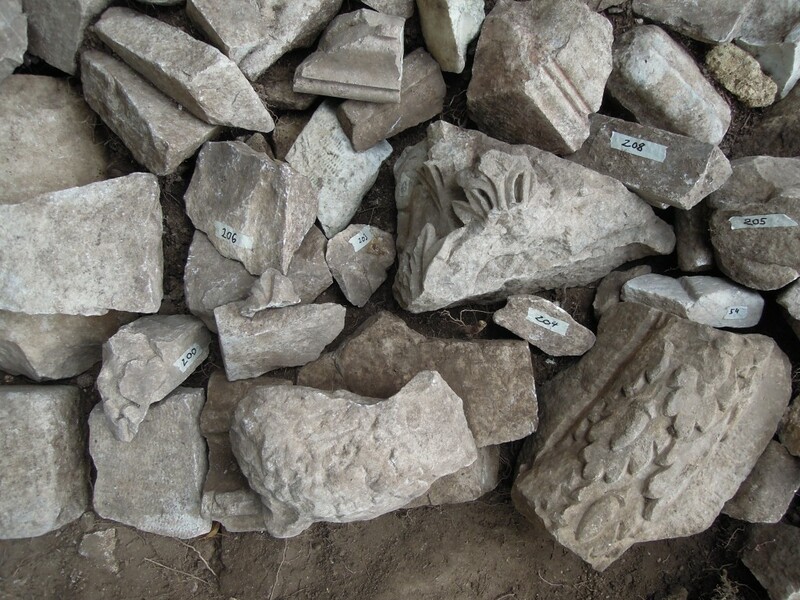 The most important marble-pile found in 2014 contained more than 200 single fragments with decoration. 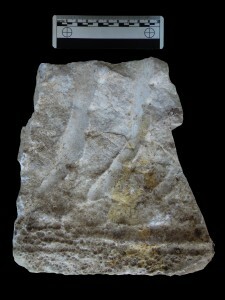 By now, about 100 fragments are documented and analysed in detail. 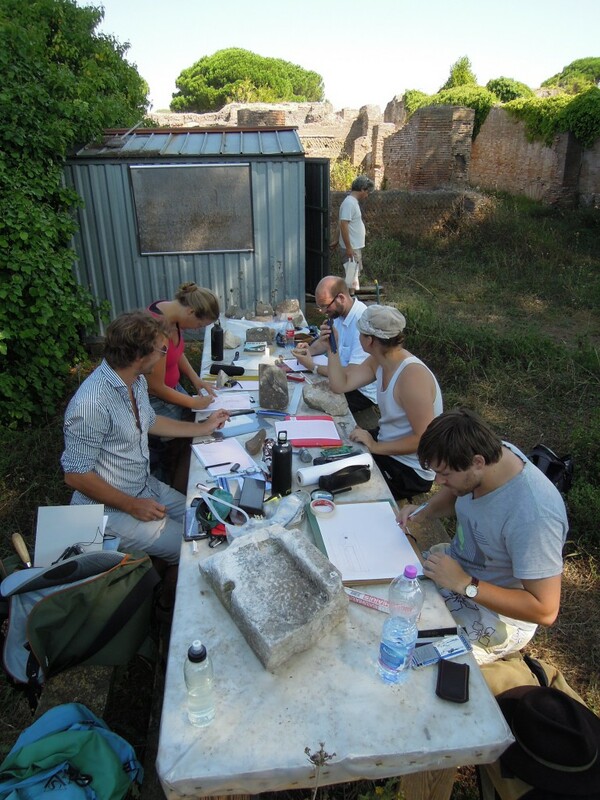 Another documentation campaign, with the help of a group of students from Kiel-University, is planned for 2015, where the remaining 100 pieces of architectural decoration of the pile of TDV and some more fragments from nearby rooms will be processed. 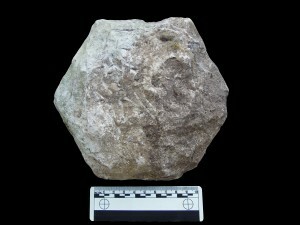 We look foreward to the new stone archive, where we should have the best conditions for working with the material. 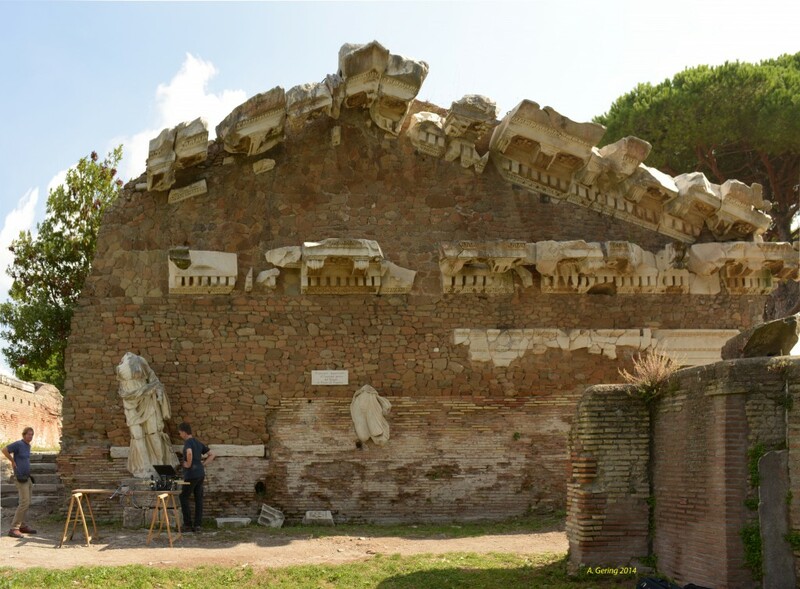 Birgit and Bernhard from the DLR (German Aerospace Centre) have photographed Calza’s pediment (picture below) to create a virtual 3-D-copy of it. 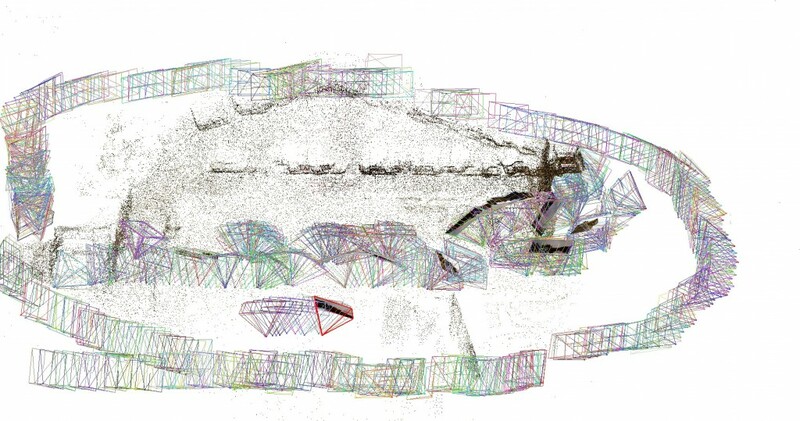 You can see the 3-D-pointcloud (see picture further below) and the various camera positions, which were used to get the pediment photographed from all possible angles with the necessary overlapping for 3-D-models. 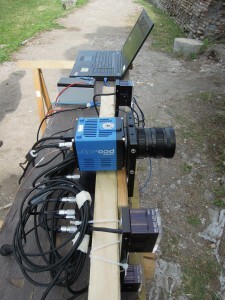 The photographic sensor was also put on a wooden beam to get the upper parts of the pediment photographed as close as possible. Several gigabytes of picture-data are processed in the moment, a work-in-progress model will be published on our webpage as soon as it is available from the German Aerospace’s computers! Why still classical measuring and drawing by hand? Archaeology in the field is by far not only high-tech work. Mainly, it consists of the „classical“ disciplines to understand a monument or a single find by studying it as close as possible: The hitherto best method is still to draw the objects or structures by hand. If you have to draw, you automatically measure exactly, you look at the wall or the object’s surface, its structure and texture, its colours, breaks and working-traces, and – often by random – you discover lots of features like drill-holes, chisel-marks, workmen’s signs and traces of reuse a. s. o. These observations can provide important hints for the interpretation and final clue for the progress of the analysis or the understanding of a whole group of finds or structures. Modern 3-D-techniques can document a surface (almost) as exact as the original. However, the process of understanding an object can only happen in the mind of the researcher, who closely examines the object with his/her eyes and sometimes additionally feels it with his/her fingers too. 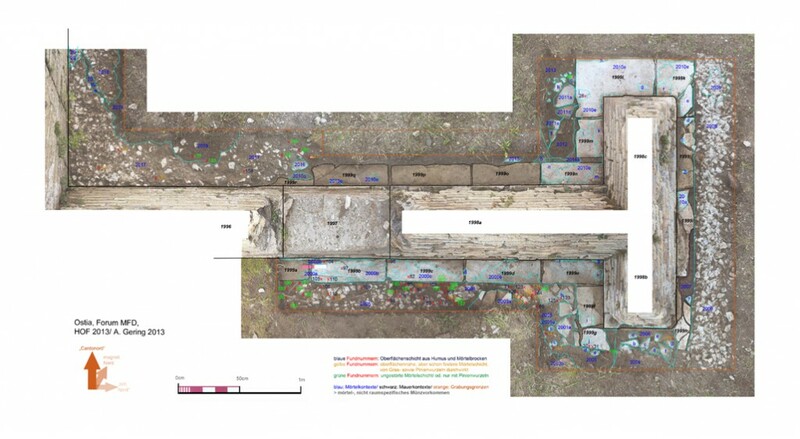 In this regard, working with an original on site is still better than the best available modern documentation methods, which only transfer the main problem of research (the lack of time for closer analysis) from the excavation site to the post-excavation processing (this includes the creation of a second problem: It is even more difficult to find funding for post-excavation-work than on the excavation site itself). The individual documentation agenda for every find evolves with the intensive study of the object with all senses. A microscopic view onto a strangely formed break in a stone can be the starting point for a very successful UV-light analysis regarding the reasons for the stone’s or building’s reuse or abandonment due to earthquakes a. s. o. Therefore, 3-D-models are surely a practical visualisation of our material on the computers in the office back in Berlin. They are an additional help for re-checking details or measures, which we have overlooked on site, they are excellent to fit pieces together in a “virtual puzzle-game”, they even allow a 3-D-print of the originals, which replace the expensive “classical” plaster-copies for exhibitions, but they are only a partially adequate source of primary systematic research. Many working hours in the campaign of 2014 were therefore spent on the original material, which we brought to our table for the systematic measuring, drawing and describing. Observing intensively is a discipline, which can be learned. 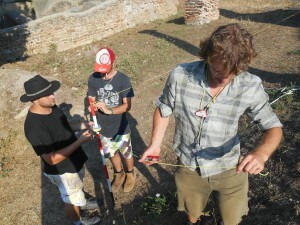 It is equally fundamental for the teaching- and research-aspect of our excavation to get exercise and practise in writing down observations in a comprehensive way, checking the colour codes (after Mansell’s famous tables), photographing correctly with proportional measures, and searching systematically for all evidence for a secondary or tertiary use of the objects a. s. o. (see pictures below). For a non-archaeologist, many of these observations seem to be restricted to minimal details, but a certain amount of these details allow us to understand the story of an individual antique object in its whole „life-history“ up until today. 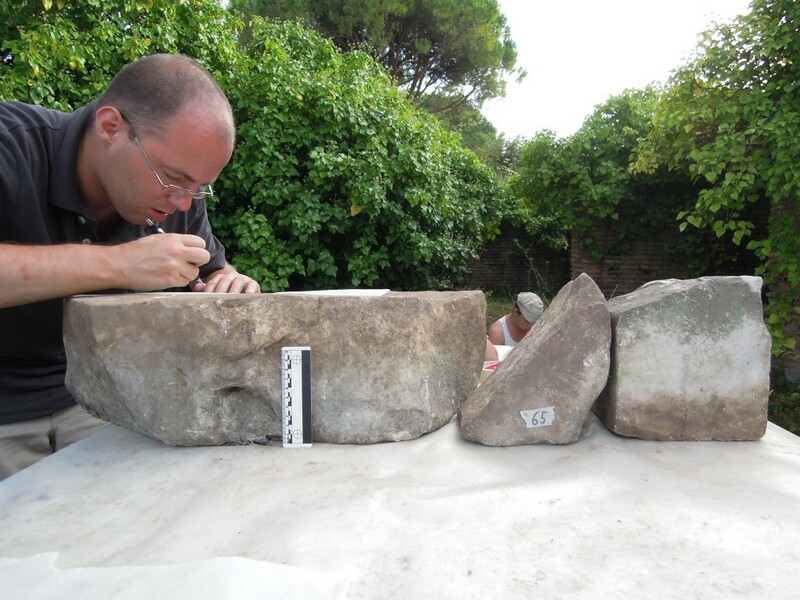 This again allows archaeologists to tell a consistent history of use and re-use, that means: A more complete story of the objects or the monuments, which they were once part of including their history of modern excavation and conservation or neglect. All further interpretation of „history“ – that means, also writing the socio-economic and political history or the history of mentality of a whole culture – is based on such fundamental narratives. With new material and new questions, history has to be re-written in every generation. This seems to be a never-ending process, but the closer the „narrator“ keeps to the only first-hand whitnesses – the remains of a culture – the more the narrative represents historic credibility. Besides all systematic approaches, sometimes randomness plays an important role in the progress of research! After an exhausting week in the August sun at the Forum, the OFP-team planned their day off in equally hot Rome, but of course – for a change – inside the air-conditioned areas of museums. So after a walk through the beautiful Museo Barraco, we went to Rome‘s paradigmatic museum regarding the late antique „afterlife“ of Roman buildings. 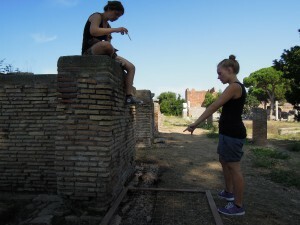 Discussions from our day-off Rome-visit: How was the working process around a lime-kiln organised? 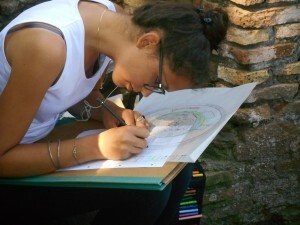 Our group visited Rome’s didactically most famous „Crypta Balbi“-exhibition. After a few hours of individual strawling around, we all met independently at one certain spot inside this exhibition, where the excavators had presented the finds from a lime-kiln dating to the 5th or 6th centuries AD. Everybody thought obviously the same: Was this not exactly the same we had found in Ostia? The size and mixture of architectural elements were indeed the closest parallel to the marble-pile found by us, and at the same time much different from the characteristics of the former excavator’s piles from 1801-1941, which you can still find throughout the city of Ostia in some backrooms or staircases of the multiple-storey houses, where the material was stored more safely than directly exposed to the sun or rain. The Balbi-evidence showed both similarities and fundamental differences regarding the question: How was the working process around a lime-kiln organised? 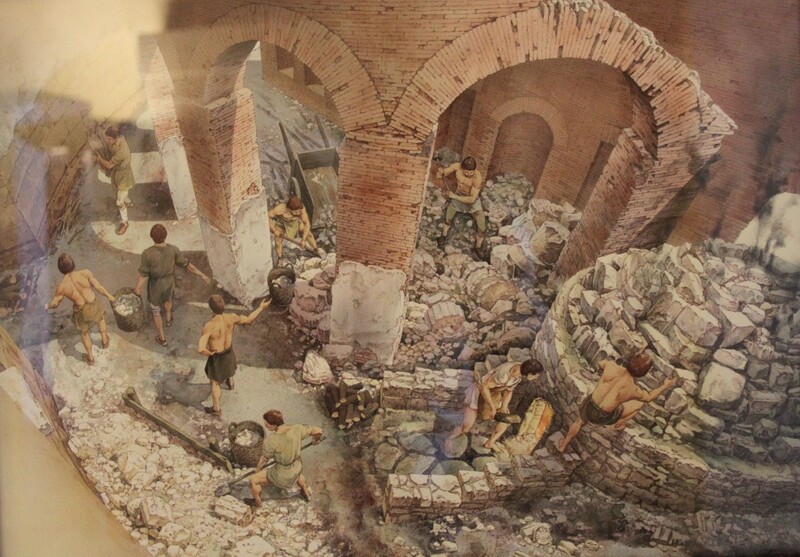 The reconstruction of the lime-kiln of the Crypta-Balbi-excavations (see picture below) concentrates on the area around the fire place, where they actually burned the marbles to chalk (every year, a fresh white paint was used for decorating and desinfecting houses used until recently – not only in the Greek islands, where this ongoing practise with white houses helped to create attractive images for tourism). Our documentation-campaign in 2013 and 2014 illuminated some features, which help to falsify, verify or supplement our imagination of lime-kilns by the presence of an antique marble workshop in the direct surrounding and several marble deposits attached to it. In addition to our results from the working campaign in 2013, we started to understand the actual processes of recycling material for new building- and decoration-activities in a more detailed way. And we started to question the myth of the „randomly not-burned lime-kiln“, a frequent motive in former research. The whole area of MFD (see pictures below) consisted of areas of properly sorted materials, ranging from bigger statue fragments to piles of extremely fragmented coloured marbles and stucco-ceiling fragments. Of course, only thin layers of these piles / collections were preserved above the ground floor, but still adequate to reconstruct the last preserved functions of the rooms inside an antique marble workshop-deposit, before it was abandoned in the early Middle Ages. Fortunately, we had found an almost perfectly preserved surface stratigraphy in 2013, datable by coins embedded in different mortar layers. To our fortune, nature helped us this time: A roughly 70 year old pine tree had started to „eat up“ the mortar layers in the more distant area of MFD as well by turning mortar slowly into simple earth. Nature‘s obvious destructive work (destructive in the eyes of an archaeologist at least) exposed an area, which we would not have excavated else. Due to our principles of minimal invasive work (see Aims and Methodology) this surely would have been true for the area underneath a formerly massive concrete-layer, where a lot of invasive work would have been necessary to gain results of an unknown value. Here it was vice-versa. By simply documenting the natural erosion we actually saved almost 100 coins from getting useless – that means, without context. 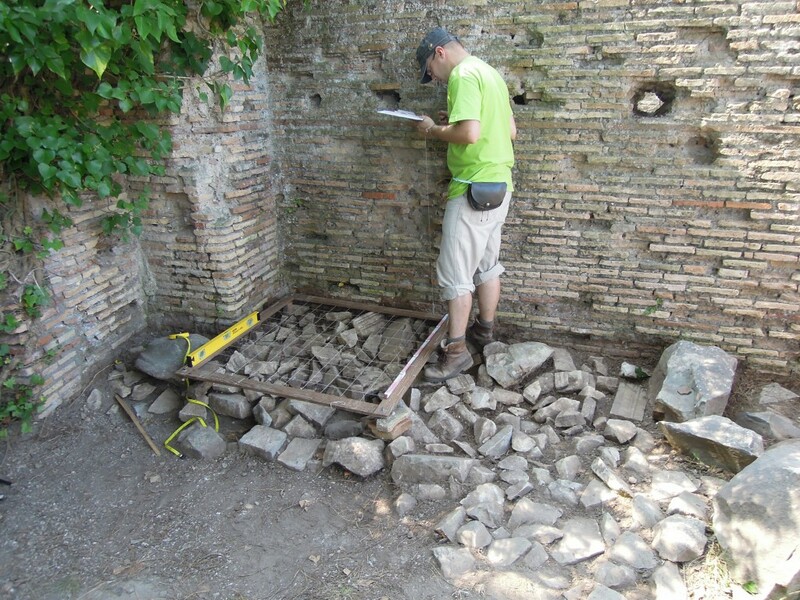 Due to the exact reconstruction of the growth of the roots, the find position of the coins could be reconstructed in the former mortar layers as well: It still resembled their antique position inside the different floor levels of the shops. The floor levels were originally sealed by a massive concrete filling from late antique times. Our efforts in saving this singular stratigraphic evidence for the Forum’s area were therefore improved and legitimised by an emergency situation: The main factor destroying archaeological evidence was this time not tourist trample, but mainly the vegetation planted immediately after the big excavations of the 1940‘ies. Reflecting about the finds of the „lime-kiln“ or an attached marble deposit from the Crypta-Balbi excavations in the 1990’ies was topic of several discussions during the next days on site. Our little Rome tour definitely had started and enriched these discussions. It had quite an impact on the emerging working hypothesis for the rest of the 2014 campaign on one hand, but also for the planned campaigns for the following years on the other. 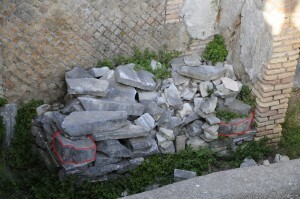 A complete new view onto the existing marble deposits started: Could other marble piles be antique as well? Could their position or at least their content be more or less in situ, and therefore representative for the last active period in the development of the antique city shape? What is a „marble workshop deposit“? 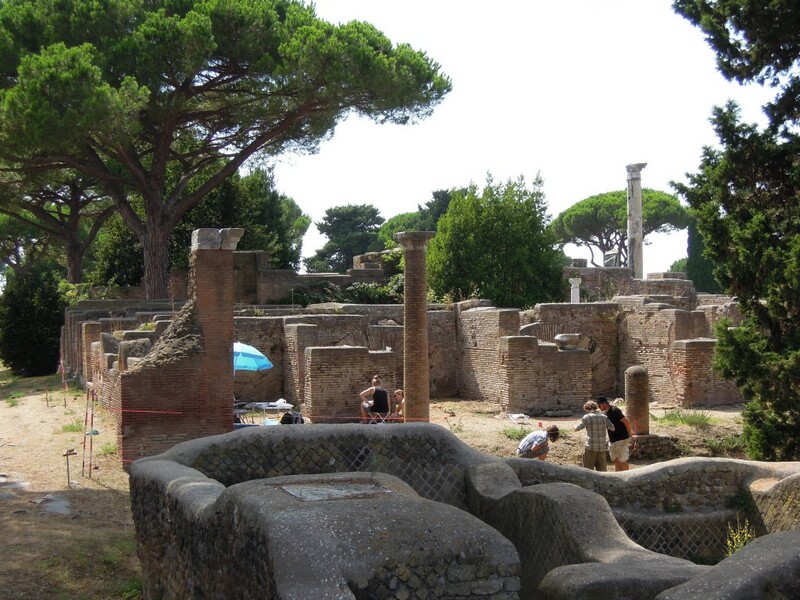 „Deposits“ of marbles can be found throughout the city of Ostia (see pictures above). 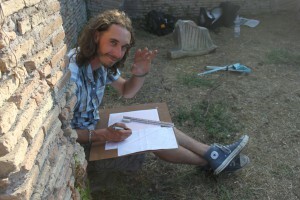 Patrizio Pensabene (see Pensabene 2007), the main specialist of Ostian marbles, has worked on this material since decades, and was able to specify all hitherto known deposits, which were uncovered by the old excavations of Guido Calza. 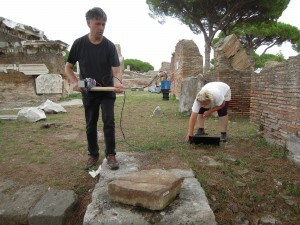 The interpretation, „deposit“, for the material, which we actually have found since 2012 in the south part of the Forum, is a result of several observations, partly based on the old diaries and photos from 1923, and partly based on a supplementing archaeological surface re-cleaning of the area in 2012-2013/14. The former doors of a row of shops, MFD (see picture below: closing walls in black in front of the rooms 3-5, 6), were closed by later walls in Late Antiquity. 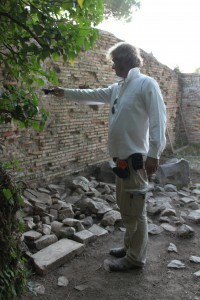 These late antique walls were completely removed by Guido Calza. The only thing remaining is their archaeological record, some minimal surface traces drawn in 2013 by our team (see picture further below). 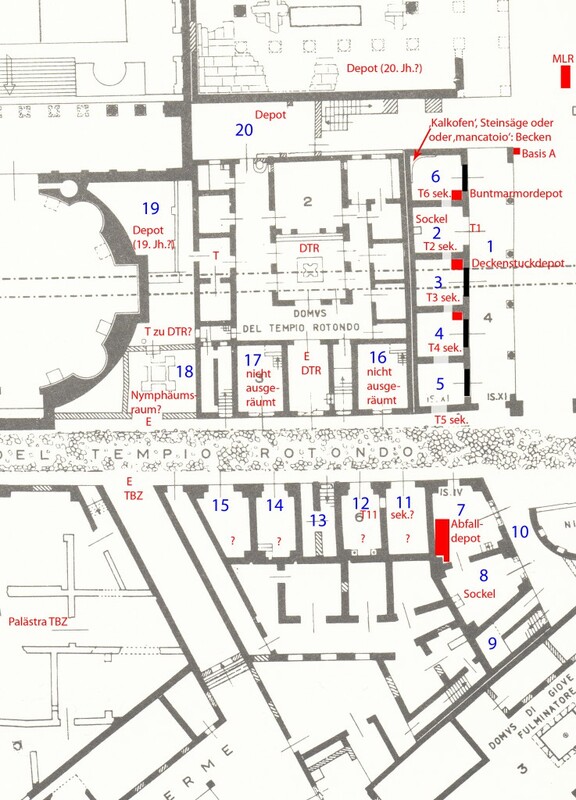 The blocking of the doors (compare the plan above) is „randomly“ confirmed by old excavation photos. 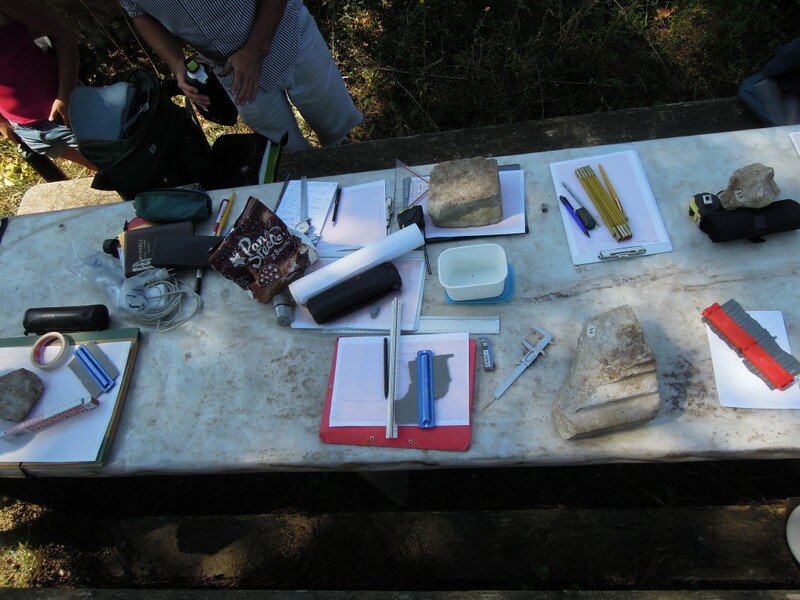 Unfortunately, there are no detailed observations by Raffaele Finelli in the old excavation diaries from 1923. 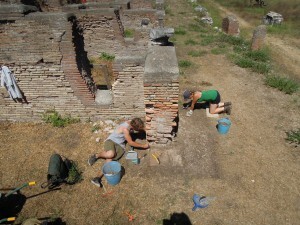 At least, the photos show that the walls were made in a careful opus vittatum work. Due to analogies of early Middle Age walls of the 7th and 8th centuries AD, which were built exclusively from rubble, we would not date our walls too long after the 6th century AD in Ostia. The comparisons of wall techniques allow a rough dating of the shop’s closing walls to the 5th-6th centuries AD or not much later. The closing of broad shop entrances with walls instead of wooden doors can only be explained with an intention to secure the material piles behind these walls for a long term perspective – a typical function of a deposit. One room attached to the „deposit“ shows signs of a round structure, which could be interpreted as a lime-kiln itself (see room 6 in the plan above). One room inbetween both areas remained broadly accessible even in its last phase – it could have been used as an actual working area inside the complex of MFD. Thus, we have separated areas for storage on one hand, and for working and reworking stones (with water installations necessary for stone cutting, which were still documented in the old diaries of Finelli from 1923) and for burning certain pieces to chalk on the other hand. Former interpretations, some even in modern research, seem to simplify chalk production to an exclusively post antique destructive process with a certainly negative connotation. Especially for an art historian’s point of view regarding statues, which were broken up intentionally to be fired bit per bit in the lime-kiln (see an example below, which we have found on the surface of MFD already in 2012). However, some lime-kilns were already contemporary with late antique production- or construction-sites. 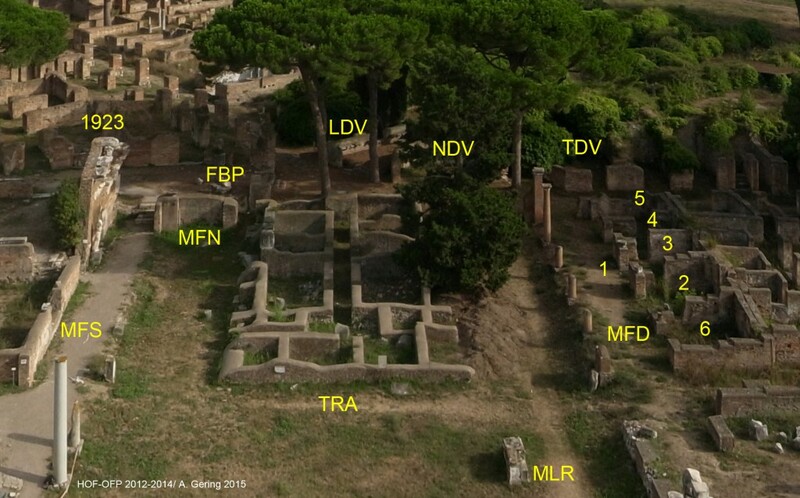 The area MFD (and the attached area of TDV in the south, see pictures below) shows clearly many different room functions regarding marble material, which was obviously reworked here for a secondary use. This main function as a production place seems to correspond with our latest newly-built shop floor dating to the second half of the 5th century AD. The extremely solid concrete floor with thousands of implemented marble fragments (probably cut offs from the previous or contemporary working processes) was designed for a regular use including many persons and/or heavy objects. 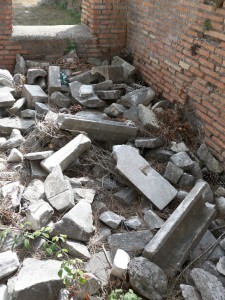 This has nothing to do with a “squatter-occupation-area”, where abandoned rooms were used as random material deposits without any new building activities included. Unfortunately, the evidence of the lime-kiln in room 6 (see picture below) appears almost completely lost today, due to erosion since its excavation in 1923. Therefore, it is so far not possible to date the structure sufficiently precise, which means either contemporary to the first workshop, which was installed soon after the middle of the 5th century AD or in a later phase. However, it cannot be dated later than the early 7th century, due to its connection to the same floor level as the workshop. Different processes of work can alse be traced in the marble pile of TDV. 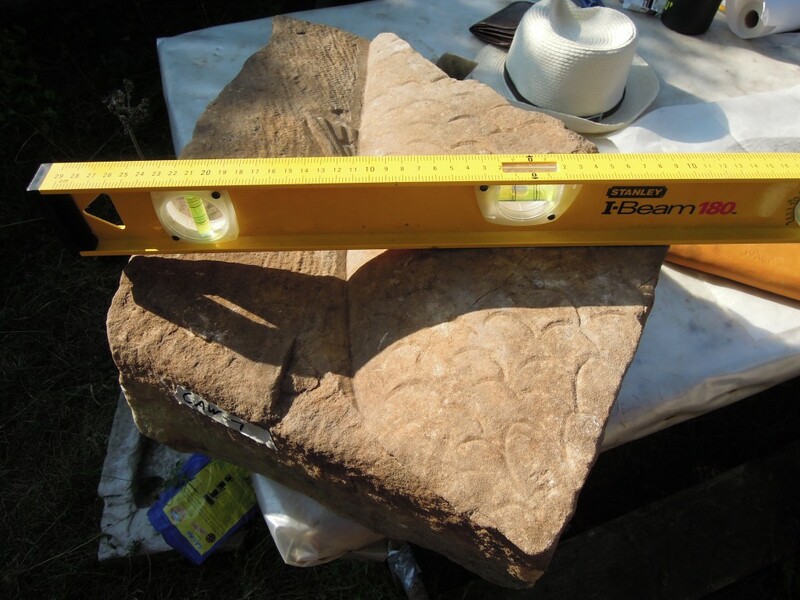 On one hand, we have found a huge quantity of pavement slabs, intentionally cut to fit in a lime-kiln, and on the other hand also bigger fragments, which were mostly decorated (see picture below). 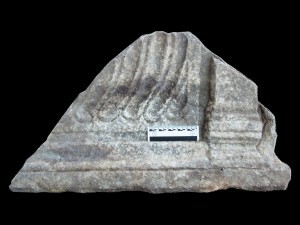 Partly they had been reworked, while many features of the original use were kept visible (see picture below: a sarcophagus-fragment reused as a flattened marble veneer, similar to the find of a strigilis sarcophagus, see picture to the right). A demand for new decoration elements is verified by a half finished late antique capital. Other fragments still contain traces of their former use, like the water basin, which was probably made from a column (see Chapter 1). 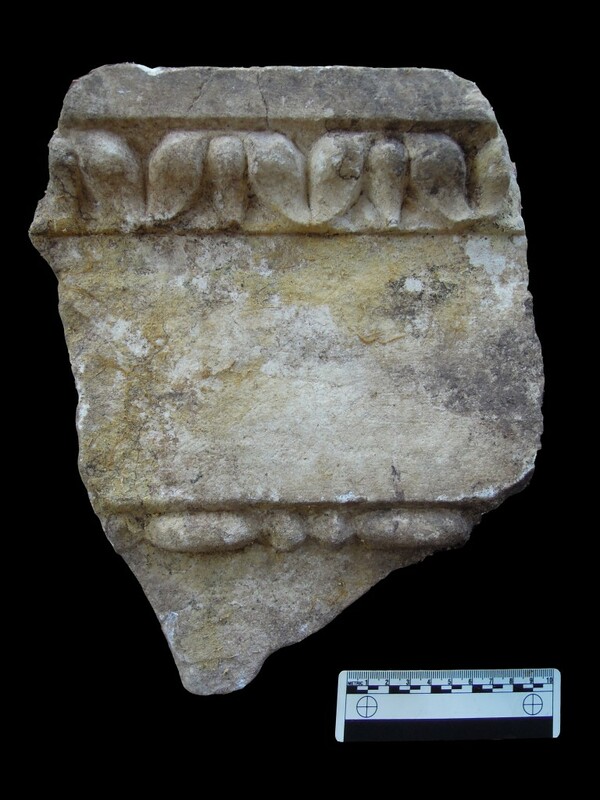 Also, vice-versa processes are documented: Finelli found, in the near of our area of TDV, a huge Corinthian capital, which was turned into a fountain or well (this is a common type of late antique reuse, which is documented by other examples in front of the museum). The capital was maybe originally from the Roma and Augustus temple. 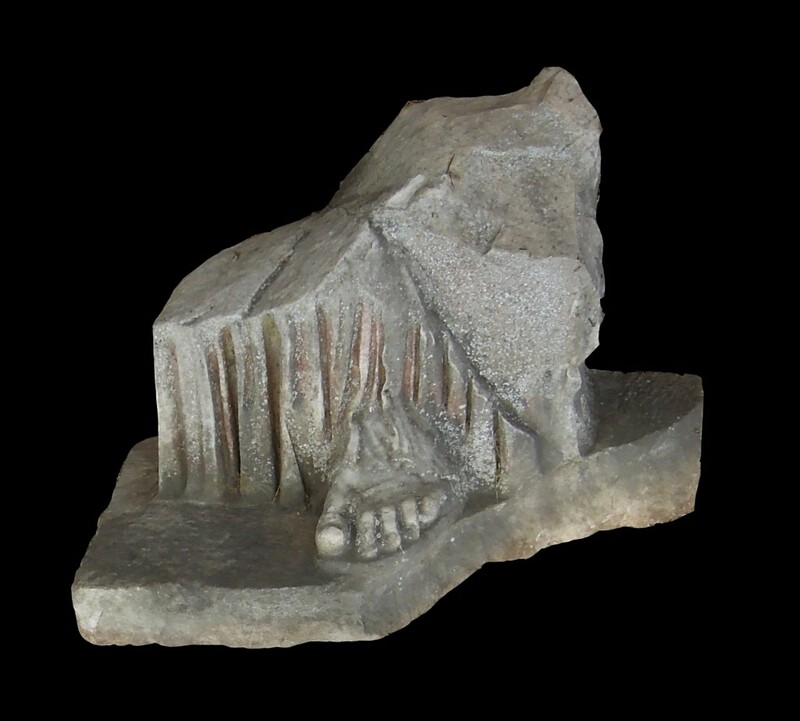 Similar examples of reuse were observed by Finelli in a context near the theatre: In 1910, he found several statue fragments and a leg of a statue of a naked woman. The latter fragment was reworked into a statuette of a praying figurine. The so-called “theatre-workshop” is, however, more likely a marble pile from the former excavations of Lanciani in the theatre, but the material itself comprises marble elements, which clearly testify an artisan’s workshop in the near of the theatre, where the theatre‘s latest decoration for aquatic spectacles of the 4th and 5th centuries AD with (already reused) naked nymphs and nereids had been reused, due to new fashions and more moralic demands of later times. Some pieces of opus sectile (see pictures below) seem to be reworked from the material of former architectural decoration. After combining some of the observations of the 2013-campaign in MFD with our new finds in 2014, a first conclusion emerged in our third week of excavation: The whole area in the southwest corner of the Forum, very close to the remaining ruins of the temple of Roma and Augustus, seemed to be dedicated to marble-deposits. Surprisingly, they were not all modern, that means ranging from the 1801-5-excavations until quite recently. The deposits we have found so far were neither clearly attached to lime-kilns. 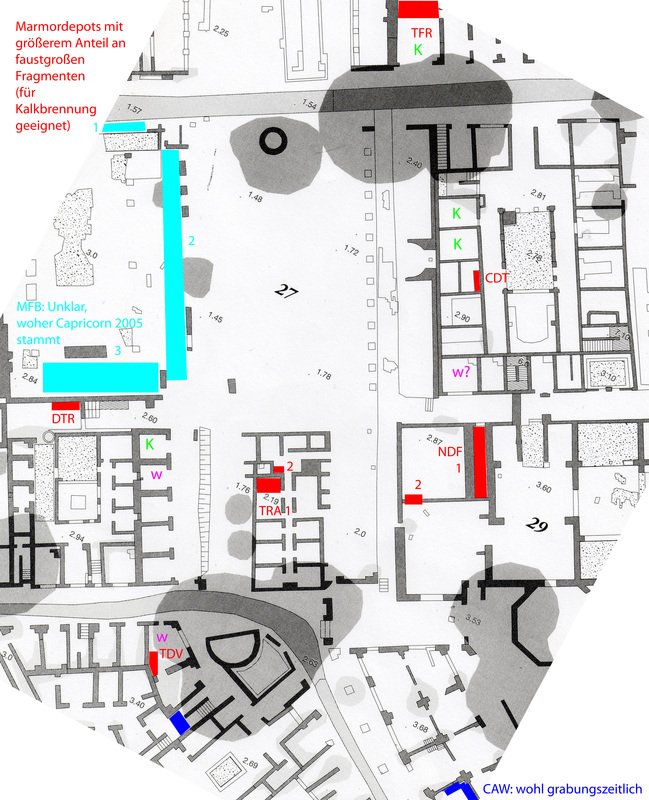 It seemed an oversimplifying theory that all marble-piles or deposits we have found so far (see plan below) had been primarily collected just to be simply burned in the (early) Middle Ages. 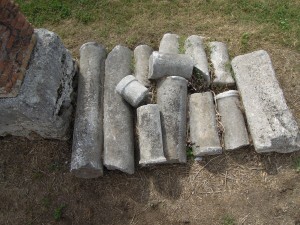 In the area of MFD and TDV, marbles from the nearby temple of Imperial cult and other monuments from the Forum’s plaza around it, mostly also dedicated to the Imperial cult, but also from other abandoned private or public buildings, were obviously separately stored for different types of reuse. This material demonstrates the continuing demand for new marble decoration and building material. What was really burned was probably a comparably small part of all marbles once stored and reworked here: The broken pieces of the artisan’s production on one hand and the cut-off fragments, which were „leftovers“ from cutting bigger marbles into certain forms like pavement slabs, wall veneers or parts of highly skilled opus sectile mosaics. Lime-kilns, in this regard, can also be understood as „side effects“ of late antique artisan’s workshops rather than their usual general interpretation as signs of the end of the Roman city in the Middle Ages. To be continued in Chapter 3!